This is Volume Two in the "My Best to You" series. Containing 13 gems of coin magic excerpted from Scott's long out of print books, this material has been edited and updated, with loads of tips, finesses, new handlings, and additions that weren't in the originals. Unique plots and twisted classics, all audience tested in the real world! 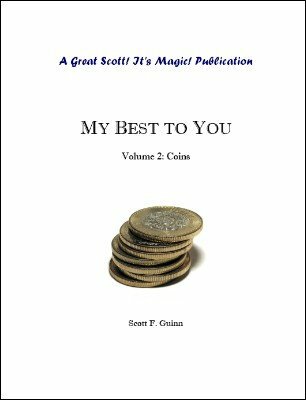 “‘My Best to You: Coins’ reflects Scott's regular penchant for excellence in production and instruction. It is very conversational and comprehensive and tackles a battery of coin effects that aren't difficult to get down, have plenty of plot to them and are engaging and fun to do. It's a lot of good stuff, well explained with clear photos and Scott's easy-understanding way of teaching. He's got something in there for everyone, every level: Clever stuff with everything from lollypops to a giant ring to a horseshoe wallet to a magic salt shaker that Goshman would be proud of--just well thought-out magic from a guy that has done it all. There are 13 effects in this gem of a book. If you just master 2-3 of them you're loaded for bear. All of them are creative and take you through the classics as well as Scott just freelancing (as in ‘Great Scott's Flurry’). Some of my favorites are ‘UN Coins Thru Table,’ ‘Eye Con,’ ‘Wormhole,’and ‘Sucker Trick.’ You'll find your own favorites in this eclectic bag of coin tricks, but Scott shows you how all the way through. And it's not knuckle-busting stuff--just good, doable coin magic that will amaze people in a variety of settings. “In this book you'll find something (if not many things) within your skill level, such as a stunning Thieves and Sheep routine. As I read the manuscript I was struck by Scott's encyclopedic knowledge of magic, so he's able to come up with neglected, little-known moves that are killer, such as a variation of the paddle move that I wasn't aware of, the Hirata master move, an easy-to-make pull, a devious coin display that conceals a jumbo coin, etc. Two routines are going into my repertoire --Scott's coins to glass and the Wormhole routine. The coins to glass has clever thinking and a powerful ending that would play well in a parlor setting. The Wormhole routine is a novel plot that reminds me of Shoot Ogawa's purse frame routine (only Scott's came out first, with credits to David Penn). A coin disappears and reappears into a ‘wormhole’ represented by a ring. If you do a mini rings routine, all you need is a half dollar and a jumbo coin and you're good to go.